When it comes to fishing, tackle makes it possible. Rods, reels, sinkers, lures, hooks, and lines are the basics. Here is a breakdown of the basics and their importance. 1. Spincast – A spincast reel is an enclosed reel with a spool feeding line out of a hole in the top. This reel is very versatile and great for beginners. It generally holds less line than other types of reels but its push button casting makes it very easy to use. Dont let anyone tell you that you cant catch fish with a spincast reel. 2. Spinning- A spinning reel has an exposed spool where the line is retrieved by the bale mechanism. When casting, the line is basically free to come off of the spool. Instead of a button being used to start the cast, the bale is opened and your finger holds the line until it is time to fly. 3. Baitcast- A baitcast reel uses a spinning spool where the other two reels use a fixed spool. This is where the dreaded backlash comes from. If the spool ends up spinning so fast that the line no longer has tension, it can result in a fishing line snarl. These reels can usually use more heavy duty line and are used to catch larger fish. Casting a baitcast reel uses a combination of both a button, and your thumb to make sure the spool isnt spinning out of control. 4. Fly reel- The fly reel is a very basic spool that you pull line from on demand. The line is pulled from the reel to gain slack in the line. The slack is used up in the back and forth casting motion of the the long fly rod. Fishing rods (poles) come in a few styles. On the left is the rod for the spinning reel. It has no finger trigger to hold on to while casting because you don’t use your thumb to cast this style. The center rod is the baitcast rod. It has a long handle and a trigger to hold on to for stability in casting. Sometime you will need to hold on to the handle with both hands for longer casts. The rod on the right is the spin cast style. It has a short handle and trigger to assist with the one handed thumb cast. The spinning rod will have larger eyes on the bottom because of the wide twirl off a spinning rod. All rods are rated based on durability and action. Heavy action rods are more rigid and can handle stronger line. Light action rods are thinner and more flexible. 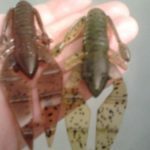 They are made for lighter line and lures. The action in the tip (top portion of the rod) can also be important. A fast tip with will bend rather easily while the rest of the pole remains fairly rigid. Not pictured is the fly fishing rod where the reel is at the bottom of the pole handle. There are many kinds of fishing line out there. 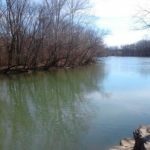 Monofilament, fluorocarbon, and braided line are the three popular styles. All lines have a test strength that can be used to judge how strong the line is. Braided line is typically the strongest. Its is just what it says it is, thin diameter lines braided together. Braided line is usually the most expensive. Fluorocarbon is the most sensitive. It is also the least visible. Unfortunately this style of line is fairly rigid so it may not be very shock absorbent. Monofilament is the most versatile. It has moderate elasticity and comes in many colors. Monofilament line is the least expensive and most popular line in general. Hooks come in many shapes and sizes. Too many shapes and sizes to show here. Something to keep in mind when selecting your hook is the type of fish you are after. A fish with a small mouth can not be caught on a large hook. But a fish with a large mouth can be caught on a small hook. 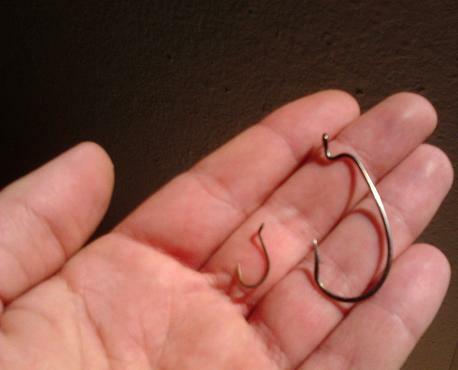 Some hooks are thinner and are called wire hooks. If your hook is too thin, it can bend when a large fish gets a hold of it. Finding the hook that works perfectly for your application make take some experimenting. Some fish might not want to bite a bait with an obvious hook, other fish wont care at all.